Microirrigation has become the fastest growing segment of the irrigation industry worldwide and has the potential to increase the quality of food supply through improved water fertilizer efficiency. 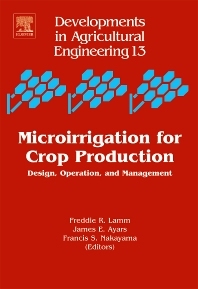 This book is meant to update the text "Trickle Irrigation, Design, Operation and Management". This text offers the most current understanding of the management criteria needed to obtain maximum water and fertilization efficiency. Researchers in crop science, agronomy, irrigation studies, food science, and environmentalists. Kansas State University, Northwest Research-Extension Center, Colby, Kansas, U.S.A. Agricultural Research Service, U.S. San Joaquin Valley Agricultural Sciences Center, Parlier, California, U.S.A. Agricultural Research Service, U.S. Arid-Land Agricultural Research Center, Maricopa, Arizona, U.S.A.